Featuring a leadership keynote and Q&A with bestselling author, Jon Gordon. 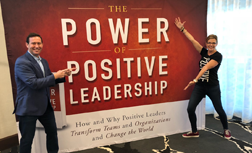 Jon Gordon and his head of training, Julie Nee, will share proven strategies and best practices to help you become a positive leader. You’ll discover how to fuel yourself and your team with positivity, build a great culture, overcome negativity, increase engagement, communicate and connect more effectively to build great relationships and teams and lead through change. You’ll leave with a personal action plan to improve your team and organization and create positive results. Who is this for? Leaders and developing leaders at all levels of the organization. Additional dates / cities coming soon. Click a location below to get notified of details as they are announced. Become a trainer and bring The Power of Positive Leadership's proven model, principles and practices to the leaders in your organization. If you are an Independent trainer you will be licensed and equipped to train leaders across various organizations. This certification will provide you with everything you need to deliver a Power of Positive Leadership Training. Upon completion, you will receive access to all materials and resources electronically, in addition to support through our coaching team. Who is this for? Those who would like to be certified to train on The Power of Positive Leadership Training Program. $2995 Per Person *Price includes Day 1 Public Training & Day 2 Trainer Certification. Train the Trainer is only for those who wish to become certified Power of Positive Leadership trainers. Attending the Public Leadership Training is required to attend the Train the Trainer session. The Power of Positive Leadership, by Jon Gordon. “We all know it is all about talented people 'working together' to create something very special: government, business, sports, and life. 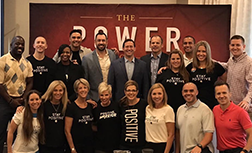 Jon Gordon really captures the power of positive 'working together principles and practices' and includes a positive disciplined process and expected behaviors that all teams can use immediately!" “A thorough and comprehensive guide on positive leadership that will help anyone become a better leader!" 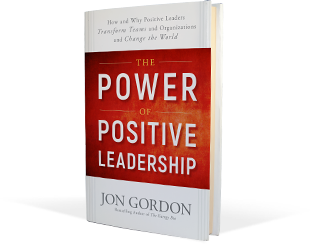 “Jon Gordon has helped leaders around the world take their game to new heights. In The Power of Positive Leadership, he pulls back the curtain for all to see how to do the same. Read this book; put Jon's principles into practice and enjoy the results!" Mark Miller Best-selling author of Chess Not Checkers and The Heart of Leadership / Vice President, High Performance Leadership, Chick-fil-A, Inc.
“Thank you for the time during our Leadership Lab offsite in Des Moines last month. The time with you was amazing and the true highlight of the time I spent in the Lab." “Thank you for presenting to Delta's Law and Government Affairs Team on The Power of Positive Leadership. Your material was informative, timely, very engaging and well received. Well done!" What is the registration deadline for these event? Three weeks prior to event dates or until sold out (previous events / trainings have sold out quickly). Up to 30 days from event, 100% refund. 15 days from event, 50% refund. 7 days from event, no refunds. Registration may be transfered to another city / date without penalty. Will you offer any quantity discounts? Training: $595 for all up to 9 ppl, 10 or more $495. TTT: first person $2,995, second person, $2,795, third person, $2,595, anything above that $2,495/pp. Yes. See lodging links above. The June Marriot room block is $129++. The July Fairmont Miramar Hotel room block is $395++. Lunch each day, snack breaks and all beverages are included in the fee. Breakfast and dinner are not included. Will Jon Gordon be there? Yes. Jon will be in attendance and will speak. If you are attending the public leadership training only (Day 1), you don’t have to attend both days. If you are a trainer and intend to be licensed to bring this training to others in your company or through your training/consulting business, you must attend both days. Day 1 is a prerequisite to the Day 2 Train-the-Trainer. Yes. A full participant kit, including workbook and support tools will be provided to each attendee. You will pay upon registration through our registration link and secure portal. If you have multiple participants and need to make alternate arrangements, please contact us directly.